The church is the focal point of the Alamo and Alamo Plaza, and a proposed master plan would redevelop the plaza to integrate its surroundings. The historic church on the grounds of the Alamo. After three years of public input and revisions, the Alamo Master Plan goes before the San Antonio City Council Thursday. There has been a long-running battle over how to renovate the grounds of the Alamo, Texas’ most recognizable landmark and one of its most visited tourist destinations. Every year, about 1.5 million people come to learn about its history. 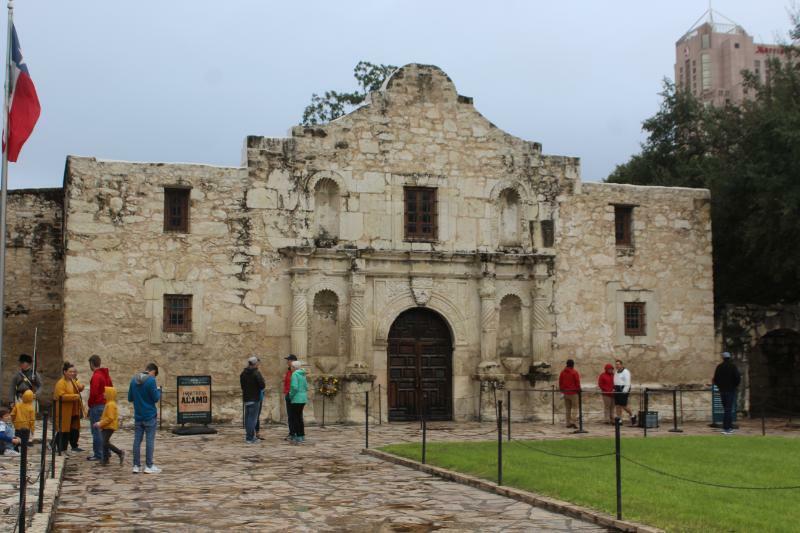 “I think for many Texans, and many Americans and many westerners, what it represents is a last stand in the defense of liberty,” says Alamo historian Bruce Winders. In 1836, the Alamo grounds were surrounded by the army of Mexican General Antonio López de Santa Anna. The 200 or so Alamo defenders were ultimately killed. The cry “remember the Alamo” would be shouted at the Battle of San Jacinto two months later, when Texas won independence from Mexico. “What the Battle of the Alamo, and what ‘Remember the Alamo’ sums up — not just for Texas but the world — is, it becomes a rallying cry or a battle cry, and those can be very important; they change history,” Winders says. Along Alamo Plaza, there are state historical markers and temporary painted markers, which were recently added, that say “known burial grounds.” There are also markings for where the Alamo walls used to be. And then there are things that don’t fit the scene, like, across the street there’s kitschy entertainment venues like Ripley’s Haunted Adventure and Tomb Raider 3D. Nearby, there’s also a shopping mall, a historic hotel and souvenir shops. Cars and double-decker tour buses zoom down Alamo street alongside horse-drawn carriages. The city and the state want this picture to look a little different.